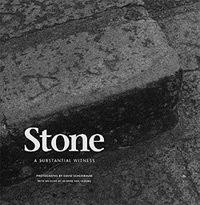 IN THE WORDS OF CHILE’S NOBEL LAUREATE, PABLO NERUDA, stone is “a substantial witness” to the “trembling world,” a solid reflection of mutable things. The photographic images presented in this volume intimately capture the enduring quality and varied uses of stone across time, geography, and diverse human cultures. The worked stone structures and natural formations presented here profoundly capture the unique ideas, shared social and aesthetic values, and religious beliefs of which they are a reflection. In stone we see both the continuum of time, place, nature, and culture and their transience. Photographer David Scheinbaum’s exploration of stone spans the period 1994 to the present and circumnavigates the globe. Not a compendium of famous sites, this is an evocation of the inherent power of stone in its metaphorical, symbolic meanings, its aesthetic expressiveness, its embrace of geological time and reflection of fleeting impermanence. Mystical Stonehenge and Scotland’s gentle Kilmartin; the Forbidden City and China’s Great Wall; Mont St. Michel, Assisi, and Pompeii; the raked-sand meditation gardens at Ginkaku-ji Temple, Kyoto; the incomparable toppled statues of Easter Island; India’s Palani Temple and Brooklyn’s bridge. Archaeologist Jo Anne Van Tilburg, a leading expert on Easter Island, contributes a farreaching essay on stone’s power to shape culture and to embody the ideas, values, and beliefs of those who work its surfaces. Stone—iconic, mutable, durable, sensual—is the chosen medium for mankind’s expression of eternal truths and a worthy subject of the photographer’s art. This Edition Was Prepared by the Museum of New Mexico Press and Scheinbaum & Russek Ltd. of Santa Fe, New Mexico. It was designed by David Skolkin. The typeface is Stone in serif and sans serif. The duotone printing on Leykam Ivory paper was executed at CS Graphics, Singapore. The edition is limited to fifty copies and ten artist’s proofs, signed and numbered. The edition is presented in a custom portfolio box covered in Brillianta cloth. Each number in the edition is offered with an accompanying signed and numbered toned gelatin silver photographic print by David Scheinbaum printed by the artist. The limited edition will offer four choices, Te Pito O Te Henua, Easter Island (Rapa Nui), 2003; Psyche Revived by Cupid’s Kiss, The Louvre, Paris, France, 1997; Tofuku-ji Temple, Kyoto, Japan, 2000; or Dindigul, India, 2000. David Scheinbaum is the Director of Photography and Artist in Residence at the Santa Fe University of Art and Design. He is co-director, with Janet Russek, of Scheinbaum and Russek Ltd., private photography dealers in Santa Fe, New Mexico. His photography publications include Bisti (University of New Mexico Press), Miami Beach: Photographs of an American Dream (Florida International University Press), and, in collaboration with Janet Russek, Ghost Ranch: Land of Light (Balcony Press) and Images in the Heavens, Patterns on the Earth: The I Ching (Museum of New Mexico Press). Jo Anne Van Tilburg holds a Ph.D. in archaeology from UCLA, where she directs the UCLA Rock Art Archive to preserve and document ancient prehistoric rock art on archaeological sites around the world. She is also director of the Easter Island Statue Project. Among her book publications are (with Andrew Tatham) Among Stone Giants: The Life of Katherine Routledge and Her Remarkable Expedition to Easter Island (Scribners) and Easter Island: Archaeology, Ecology, and Culture (Smithsonian).